Till my adulthood, I had no idea that the clove was mainly known and used as a spice in Asian cuisine. In fact, for many years the clove’s intense flavor reminded me of nothing but those nasty toothaches surfacing in the middle of the night when my mother, benefiting from his father’s dentistry tools and knowledge stuck a clove bud in the toot as a temporary relief. Many years later, I learned that clove is native to Indonesia and has been consumed in Asia, far and Middle East and Africa for over 2000 years. The buds are picked by hand when they are fresh and pink, and then dried and sued as whole or grounded. You could buy ground or whole clove from local spice markets and ethnic stores and even major supermarkets. I receive mine from medicinal herbs store (called “ataari”) in Iran, ensuring a superb quality! Whole cloves are preferable over ground cloves because as such they maintain their aroma and flavor longer. You could use grounder though if a certain recipe requires ground clove. This is my new discovery about how to tell good clove from stale ones: Place a clove in a cup of water. If it is a good quality, it should float vertically; if stale, it will either sink or float horizontally. Also, good quality clove releases some of its oil when squeezed with a fingernail. 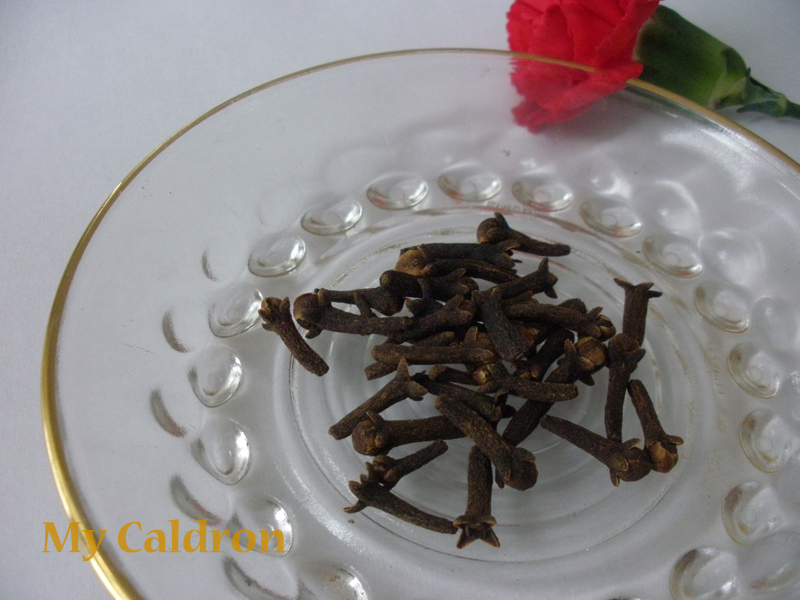 Clove is strongly aromatic and has a sweet and warm taste which makes it an ideal ingredient in a wide verity of drinks, sweets and foods around the world. The two general rules about cloves culinary use are 1) moderation in quantity 2) in combination with at least a couple of more spices. In my experience, clove goes extremely well with cumin and cinnamon as is customary in Mexican Cuisine. I already have two recipes for cloves in a drink here, and in an Indian food here. Search for other clove contained recipes if you will, and share here the ones you have already tried and liked.